"How to Train Your Dragon" by Cressida Cowell is one of the all-time favourite books in this household, and whenever another book in the series is released we do a dance of joy! We love dragons, and this series is excellent on many levels. 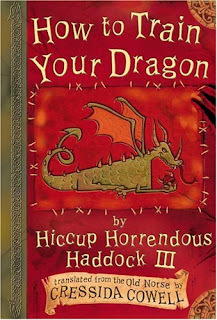 Hiccup Horrendous Haddock the Third is son and heir to Stoic the Vast,chief of the tribe of Hairy Hooligans. Small, skinny and entirely un-heroic, he is a keen naturalist and "Dragon Watcher" who, when he comes of age and gets his own dragon along with all of the other boys in his village, cannot train his dragon by the traditional method of 'Yelling At It' because he lacks that violent Viking touch. The other boys (and their dragons) taunt and torment Hiccup and his tiny green dragon, but Hiccup and his best friend Fishlegs decide to try other training methods in hopes of getting their dragons to obey. Hiccup's research into Dragon Psychology, and his nerdy ability to speak Dragonese, make him uniquely qualified to save the day when an enormous Seadragonus Giganticus Maximus washes up on the beach and threatens to devastate the village and eat all its inhabitants. Brute force and Yelling would be useless against this massive predator. Hiccup leads the boys from his own and the neighbouring village, and all their dragons (except for Hiccup's tiny, stubborn and naughty Toothless, who is too scared to help), in a brilliant and desperate plan to defeat the wicked mountain-sized dragon. How To Train Your Dragon is also available as an audiobook. The audiobook version we had was read by David Tennant and his voice really suits the characters. That version is available on www.amazon.ca. "How To Be A Pirate", book two in the series, introduces Hiccup's evil nemesis, Alvin the Treacherous. Hiccup has to make a difficult decision: To win fame and glory for himself, of do what's truly best for his tribe? A great story. Later books introduce Camacazi, a sword-fighting virtuosa, daughter of the Bog-Burglar leader Big Boobied Bertha. Together Hiccup, Fishlegs and Camicazi save the day. These books are recommended for 'reluctant readers', and the frequent funny illustrations make them page-turners for boys and girls. Even I await the next book with bated breath! There seems to be a movie coming out, but from what I've seen of the trailer it is completely different from the original story, and I cannot recommend it. Hmmm. Something I'll have to get for Sir Rodney the Strong to read. Not that he's much of a reader - and he's old enough now that his eyesight isn't so good and reading by firelight is pretty much out of the question. Although he does love the sound of Bryge's voice and I'm sure she would love to read to Sir Rodney, who, like I said, only reads well in the daylight. 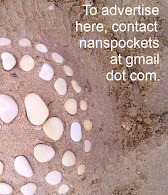 Sir Rodney thanks you for the recommendation. these books sound fabulous!! will keep them in mind when chewie moves out of the picture books! I actually enjoy these books as much as the boys... There is one (can't remember which) where you discover the romantic past of Hiccup's parents, and it's VERY grown-up, though the kids would never notice. Hiccup's mother was in love with a Hero, who mysteriously disappeared. She thought that she had been jilted, and married Stoik the Vast. I love how the characters are developed as the stories continue. Anyway, the Hero turns up, and it was all a misunderstanding... he'd been trapped, enslaved, all those years. What will become of Hiccup's parents? My sons are gonna LOVE these, Nan! Funnily enough, I bought several of these books a few months ago and tucked them away for future reading with the wee ones - secondhand, £1 each, totally worth it. The author has also written a children's picture book the children really love (Hiccup, the Viking Who Was Seasick) based on the same characters. I'm looking forward to reading the older books. You may also enjoy "The Dread Crew" written by a local author, Kate Ingalls.